Toubkal circuit is one of the top treks in Morocco, with many spectacular high passes and circular route via Ifni lake. 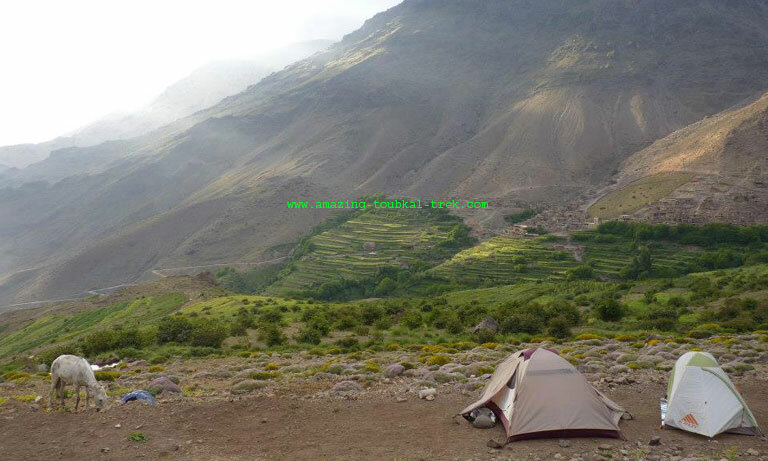 You will discover the diversity of Toubkal, by traversing the valleys from one to another and climbing high passes from which you will have stunning views of the high Atlas. At the end of the Toubkal circuit after discovering the Toubkal from all angles, you will climb Toubkal, Morocco’s highest peak. 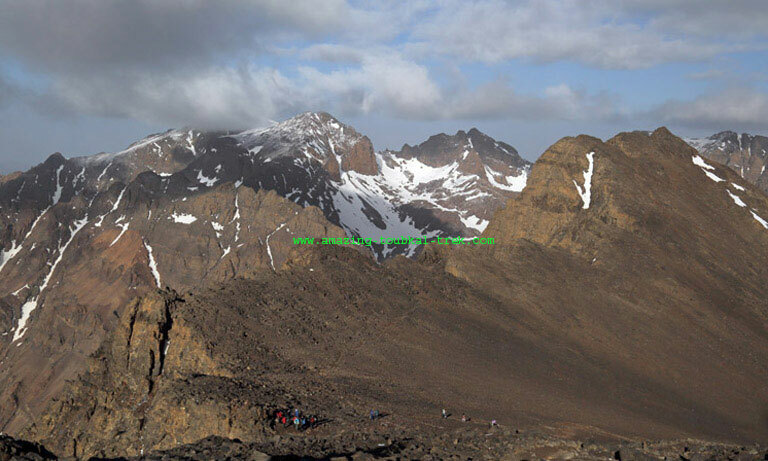 – Make the ascent of North Africa’s highest peak – Mt Toubkal. – Visit Traditional Berber villages. 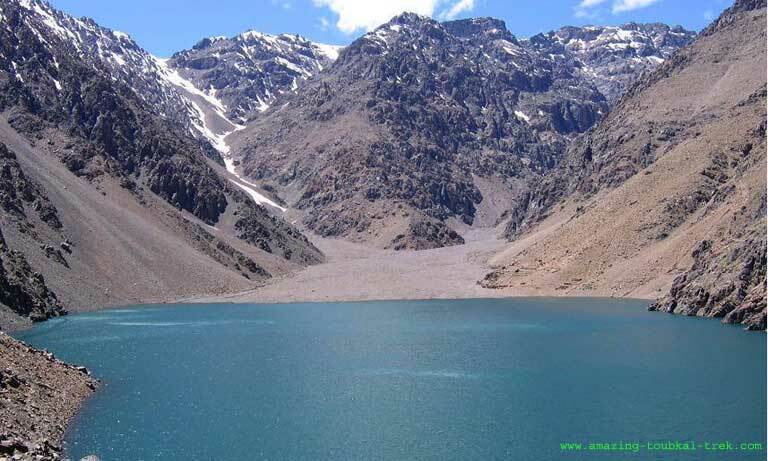 – Discover the beautiful Ifni Lake during the Toubkal circuit. Arrival and spend the night in a hotel in Marrakech. After breakfast in your hotel, we head towards Atlas mountains drive to Imlil. We meet the mule team and trek towards Tacheddirt via Tamatert Pass. We continue down to the beautiful village of Ouaneskra, then a short walk from here into the valley takes us to our campsite. Overnight in tents. The total duration of the trek is 4 hours. Early in the morning, we begin a long gentle climb to the top of Likemt pass from where we will enjoy the magnificent view. We then walk down to the pasture Azib Likemt. Setting up our tents for the night. 5-hour trek. Today, we will see different landscapes and enjoy breathtaking views of the Toubkal Massif from the pass, the Amsouzart Valley and the east face of Mount Toubkal. The trail leads on to Amsouzart village. Overnight in a local gite. 6-hour trek. After breakfast, we make our way towards Ifni Lake, past several Berber villages on the road, besides beautiful views from the Toubkal mountain. We can get by lunchtime and spend the afternoon relaxing and have lunch near the lake. We spend the night in tents. 4-hour trek. We trek up to Ouanoums Pass after breakfast. We then take a long descent on a zig-zag trail down to Toubkal refuge. Overnight in tents. 6-hour trekking. We’ll make an early start to catch the sunrise from the summit of Mt Toubkal. Views are fantastic from the mountain and well worth the hike. We then descend back to the refuge and head down to Imlil through Sidi Chamharouch shrine. Transfer back to Marrakech. 8-hour trek. End of mount Toubkal circuit. 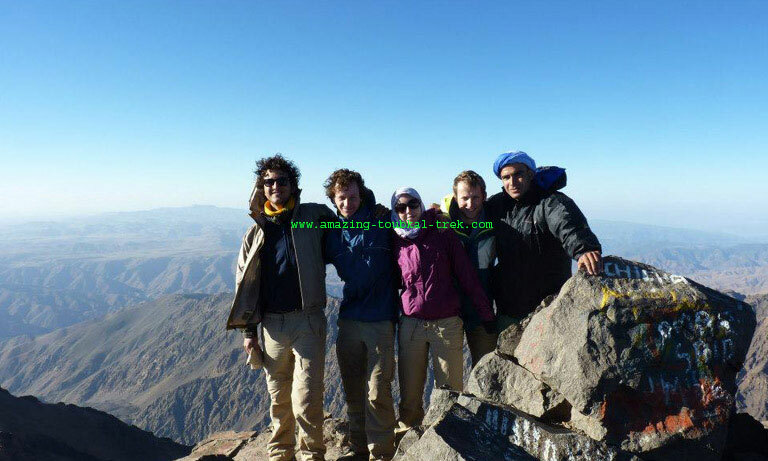 – The Toubkal circuit is available and can be arranged for groups of all sizes. Toubkal circuit trek via Ifni lake is the best tour that can be done only in Summer. Mount Toubkal Trek Via Ifni lake, Toubkal circuit trek.